Citation: C N Trueman "The fall of Ancient Rome"
The fall of Ancient Rome started from about AD 190. The Roman Empire was attacked by tribes such as the Goths and the Vandals. Civil wars in parts of the empire further weakened the rule of Rome and respect for Roman law dwindled as a result. Why was the empire attacked by fierce tribes people? Tribes such as the Goths wanted to move south into parts of Europe that experienced a better climate that would assist their farming. This could only bring them into conflict with the Romans. At about AD 190, Rome also experienced a succession of poor emperors who simply were not capable of doing the job. The Roman Army was spread throughout Western Europe. Each part of the army had its own idea as to who should be emperor. When one part of the army succeeded in putting its own man into the position of emperor, another part of the army would fight to put its own man in power. Between AD 211 and AD 284, there were twenty-three ‘soldier-emperors’ – and twenty of these men were killed by rivals! Clearly law and order and respect for that, within Rome itself was at fault. in AD 284, the emperor Diocletian realised that something had to be done or Rome and its empire would disintegrate. He decided to divide the Roman Empire in two to make it easier to rule – he created the Western Empire and the Eastern Empire, each with its own leader. This split geographically was all but a north to south divide between the empire with Spain, France, England, Italy and parts of Germany forming the Western Empire and all areas to the east of this were in the Eastern Empire. However, Diocletian faced more than just administrative problems. More and more military defences had to be built across the whole empire. This cost money that Rome did not have. To pay for these, taxes were increased and extra coins were minted. This lead to inflation causing prices to rise. Therefore, the people of Rome were less than favourable towards those who led them. With threats from tribes in northern Europe, financial problems in Rome itself and a civilian population becoming more and more discontented, Rome could ill afford further major issues. In AD 307, Constantine became emperor. He ruled from AD 307 to AD 337. Constantine was Rome’s first Christian emperor and he is considered to have been a strong ruler. He believed that Rome as a city was too far away from vital areas of the empire to be of value from a governmental level. Constantine, therefore, moved the capital of the empire to a new city – Constantinople. This was a new city that was built on the old city of Byzantium. Whatever the motives were, Constantine’s decision was a poor one. Constantinople was much further east than Rome and firmly in the eastern empire. This left the western empire very vulnerable – though the eastern empire was hardly free from attacks. The Ostrogoths attacked the western empire via the eastern empire. The Huns, a fierce tribe from Asia, attacked the western empire. The Franks, Visigoths,and Burgundians all made large inroads into the western empire. The glory days of the Roman Army had passed and the Romans were forced into making deals with the tribes. The Vandals and Visigoths were allowed to live in the Roman Empire as long as they gave a promise to protect the empire from the Huns. However, in AD 398, the leader of the Visigoths, Alaric, realised that the Roman Army was so thinly spread, that Rome itself was for the taking. Alaric moved cautiously south but in AD 410 he captured the city of Rome. The city was sacked. Roman held territory in Spain, France, northern Africa and England all fell to the various tribes that attacked them. 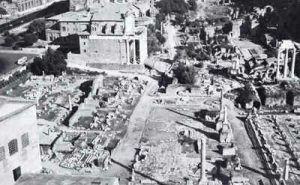 In AD 455, Rome was attacked again. This time the damage was done by the Vandals. The city suffered serious damage. In AD 476, the last Roman emperor in the west, Romulus Augustulus, was removed from power by Odovacar, leader of the Goths. This date is usually used by historians as the year the Roman Empire ended. However, Roman rule continued in the eastern empire for a number of years after this date – in modern Greece, Turkey, the Middle East and northern Egypt.